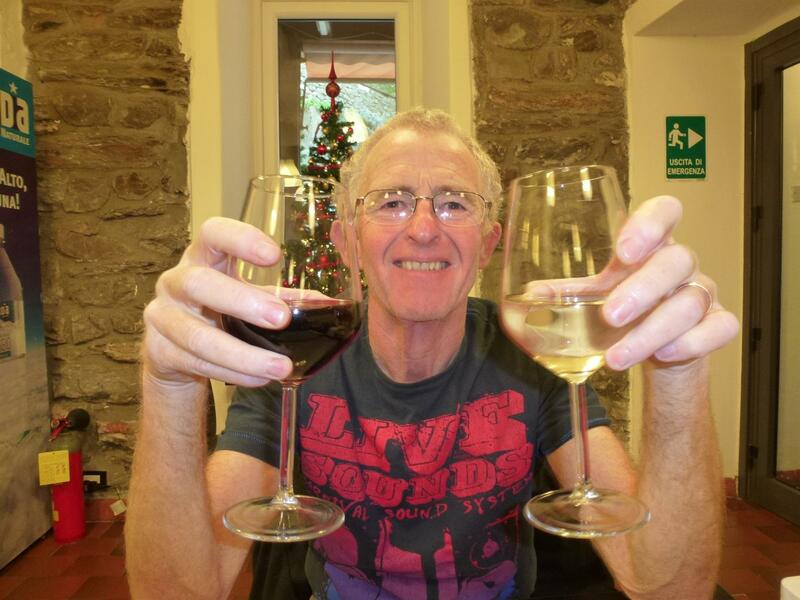 Our route inland to Tuscany had a major obstacle in the way, Florence. We really did think about going into the city but the fog was so thick it just seemed pointless. Instead we decided to treat ourselves to another motorway toll, we know how to live, three hours driving up to Scaperia became one hour. There was absolutely no point in taking a scenic route with visibility down to a couple of hundred metres and no sign of the fog even starting to lift. We were thinking it would cost us €7 or €8 but smiles all round when it came to €2.20, bargain. Slowly but surely we are beginning to like toll roads when the need arises. Our first stop was very untypical Tuscany, more Spaghetti Western in the form of Ranch Ricavo. The cowboys came out and told us not to park on the grass as it was muddy and instead they set us up beside the house with electric and free use of their wifi. There was a saloon, tepees, ranch riding arenas the lot – it just needed Chuck Connors and we could have been in a Fist Full of Dollars. The ranch was set miles back from the road, not a sound other than a charming donkey braying well into the night and a few guns going off in the woods where we assumed it was hunting taking place rather than an Indian massacre. 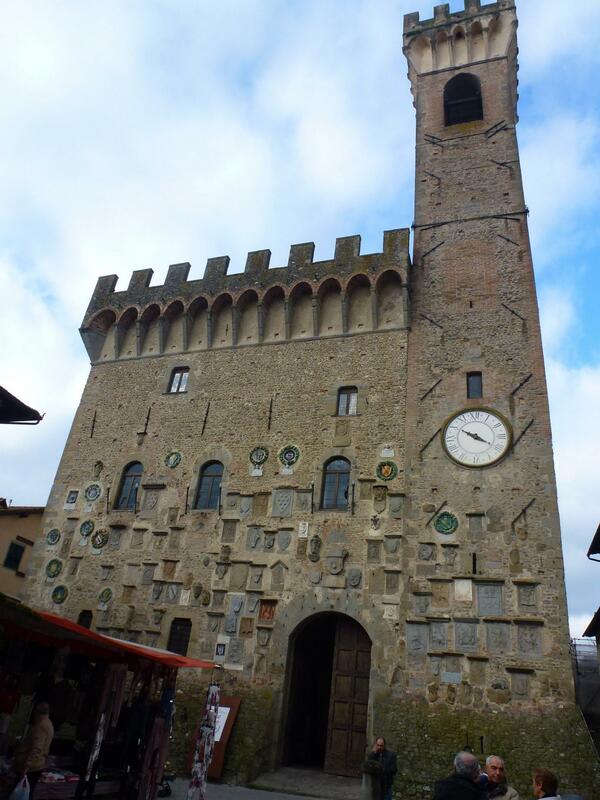 Our first Tuscan town to visit was Scarperia, with it’s 14th century Vicars Palace and church of St. Jacob. Unfortunately it was market day when we went in, the narrow streets were jammed to the edges with stalls which made seeing any architecture a near impossibility. 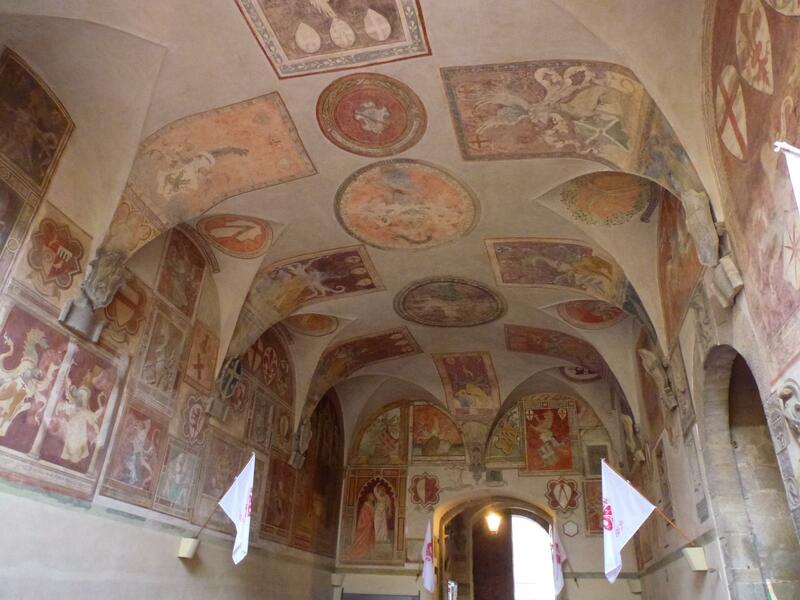 The Palace was open and we saw the 15th century fresco paintings but the church and other structures were too well hidden behind markets stalls and Christmas trees. It seems that every day is market day in Italy, where ever we go there is a good market on. Each one has been what we would term an old fashioned market, stalls selling quality clothes, fruit and vegetables, household goods and toys. They don’t seem to specialise in tat and cheap goods as markets do at home nowadays, the exception being the Looky Looky men who we see at every market trying to sell umbrellas and failing quite miserably in this sunny weather. 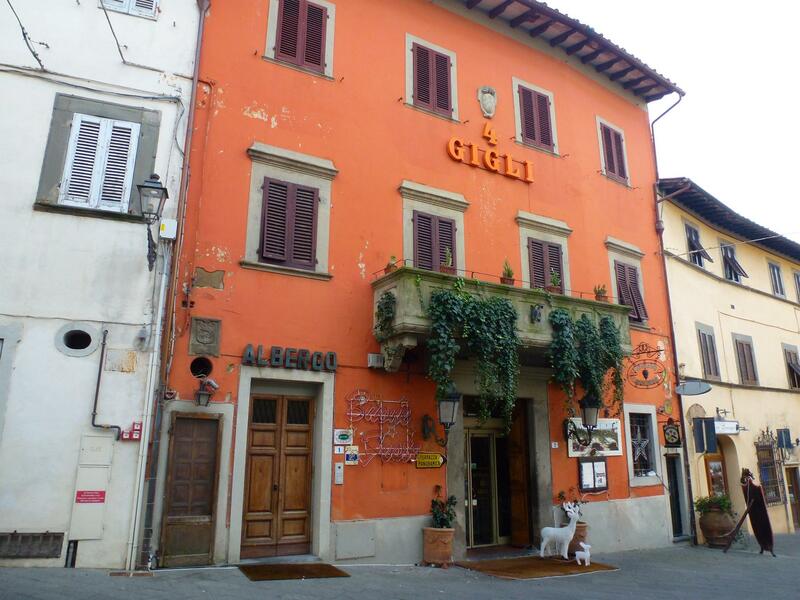 The villages and towns around the area we were in, Mugello, appeared reasonably well to do – probably as we were less than 25 km from Florence. The shops on main street in Scarperia were reminiscent of a decent food hall in any major city. Each shop had an immaculately dressed window and I would bet my last euro there wasn’t a type of fruit, cheese, meat or wine you could name not for sale in one of them. We chose la pasticceria to pick up some foccacia, lovely lady serving decided the queue of customers could wait whilst she gave us a sample to try before we bought. At this time of year there doesn’t appear to be any tourists in the villages and small towns so everyone is super friendly and helpful when they hear us stutter out our limited Italian words, yes we are still very poor at Italian, at least Iain has stopped saying “Pretzel” instead of “Prago” – that’s progress of sorts. By mid week week we had finally fixed the 12 volt supply on the fridge, a connection about to burn out. Swiftly sorted with a new connector and hey presto that damn noise like a swarm of bees has gone. The feeling that all’s well in the van was never going to last though. Our first tank of LPG was empty so it was time for a fill up. We pulled into the Esso station, the attendant appeared and advised we couldn’t fill up “not for cooking”. Not being easily deterred we tried the next at the Agip station, same result. We contacted Gaslow for some advice, they advised LPG for cooking has a higher tax and stricter policing now means garages aren’t selling to motorhomes. Whilst we weren’t desperate for gas we decided to try again out in the sticks. We found a small garage – the attendant came over and said ‘cooking?’ Iain said no and pointed to the engine, at which point the attendant shrugged and filled us up. We now have enough LPG for about three months so we wont be worrying about it again until we are in Greece, where hopefully its still ok for us to buy in garages. 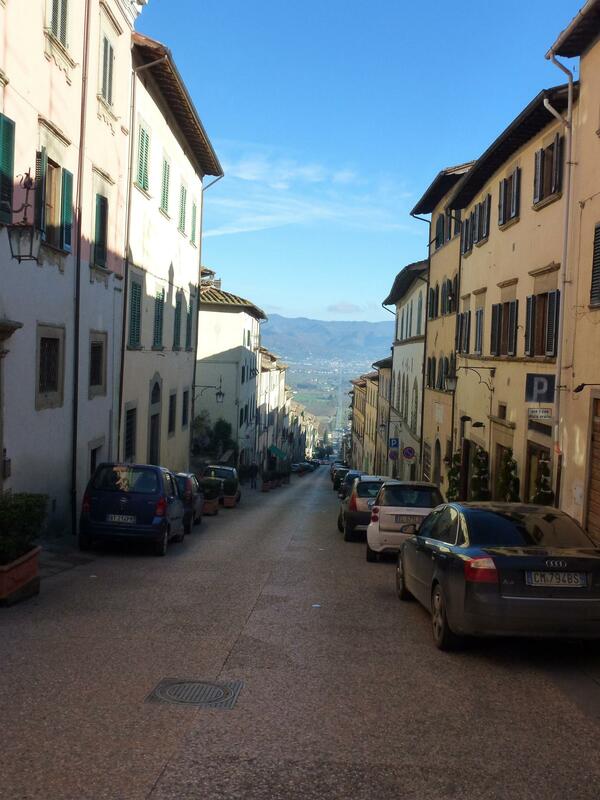 On our route to the Adriatic we wanted to search out a couple more of the hilltop villages that Tuscany is famous for. Using minor roads it has taken an age to get anywhere for the last few days, on the flipside we have been treated to some of the most glorious views imaginable between the villages. The roads climbed steeply over mountain like passes, hairpin bends and sheers drops down into the valleys but hardly another vehicle on them. One thing that is missing in Italy has been anywhere to stop and look at the views, on these mountain roads there are not any laybys or viewpoints, its a case of sticking your head and camera out of the window and hoping for a good photo. 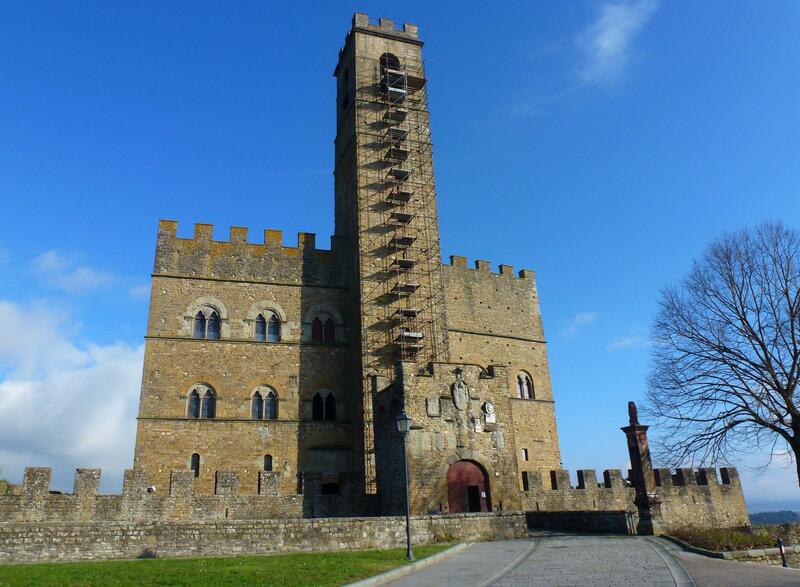 Our first planned village stop was Poppi, we just had to park up at the bottom on the hill and walk up to the old medieval hamlet on top of the hill where a walled fortress and a stunning castle tower over the surrounding valley. 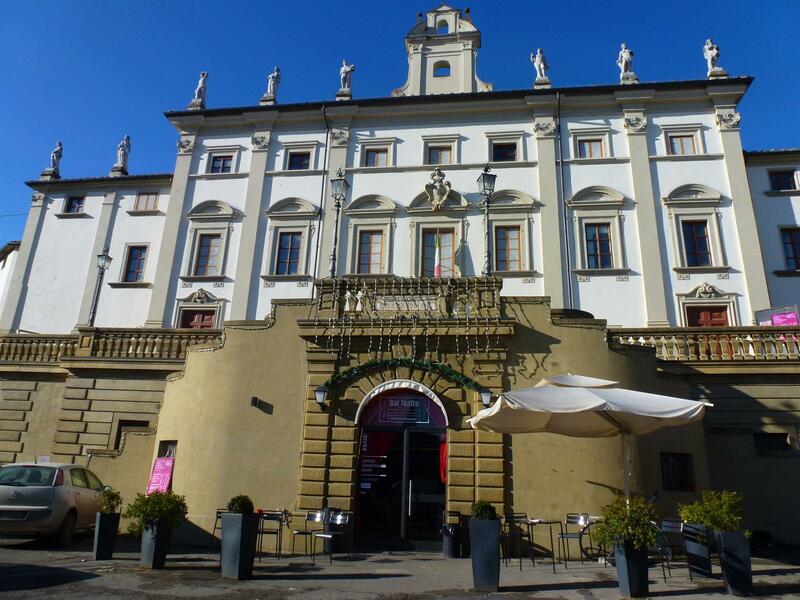 The Castle is said to be the prototype of the Palace de Vecchio, most of the palaces look very similar so who is to say differently. On the opposite side of the hilltop is the Abbey of San Fedele built in 1185, it houses the remains of Saint Torello who was born in the village, as we have found usual in Italy the church was open, inside a superb burnished bronze and silver bust of Torello, made in the 15th century, was on display. The narrow streets were all decorated for Christmas but there were very few shops, the majority being down in the new town at the bottom of the hill. Very few tourists too, with it being the last Saturday before Christmas most people probably had better things to do than traipse up a big hill to look at a castle and an abbey. It has to be said though that the Christmas preparations seem less frantic here, over the last week we have seen several places just starting to put up decorations and people are more likely to be sat in cafes and bars than wandering around the shops loaded down with bags. Fear not though Slade and Roy Wood, together with any number of versions of Band Aid can be heard in every shop and cafe, even in Italy the variation in Christmas tunes is limited! After a few hours in Poppi we headed to our Agricultural tourism sosta a few miles out of town. As we turned off the road and drove up the two mile driveway to a beautiful Tuscan villa we were both a little awestruck, when the owner came out and said they were closed we were slightly miffed to say the least. As it was late afternoon and dusk was well on its way we just knew we were going to wish we had a backup plan. We put Sat Nav on and headed for a Camperstop an hour away, arrived to find it demolished. Not to worry, its now getting dark but there is one another 9km away, get there it a stark and empty industrial estate and its no way Jose. Next attempt, a rather un-gorgeous car park in the middle of a town. We have been so incredibly lucky with stops so far, everyone has been clean, well lit and seemed safe. 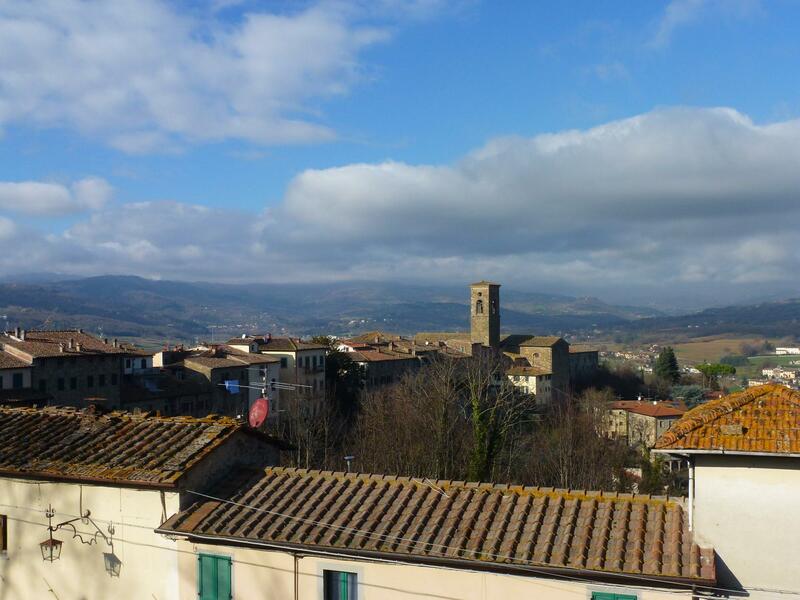 We agreed one last try and headed another 20 minutes down the road to Anghiari with fingers crossed and an agreement that the carpark there would have to do if nothing else. Our luck was back in as Val Della Pieve Campsite is top of the mountain in terms of destination and result, it would be difficult to find a better place to stop. Our pitch is on a terrace looking out over the valley, there is a wonderful shower, it’s five minutes walk to the village and although it takes 10 vans there is only us here, the best way to describe it would be like a very good CL in the UK. After a few traumatic hours all was well with our world again. This was to be a one night stop but it would have been criminal not to stay for two nights and have full day exploring. 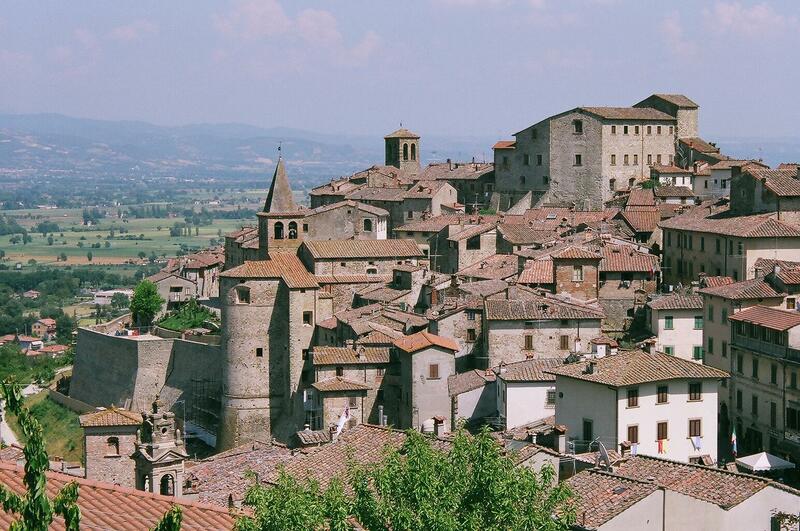 It’s a small medieval town perched atop a hill with views over the valleys for miles around. From the top of the hill the road is dead straight and runs for literally miles down and across the Upper Tiber valley to Sansepolcro, over 7 km away. 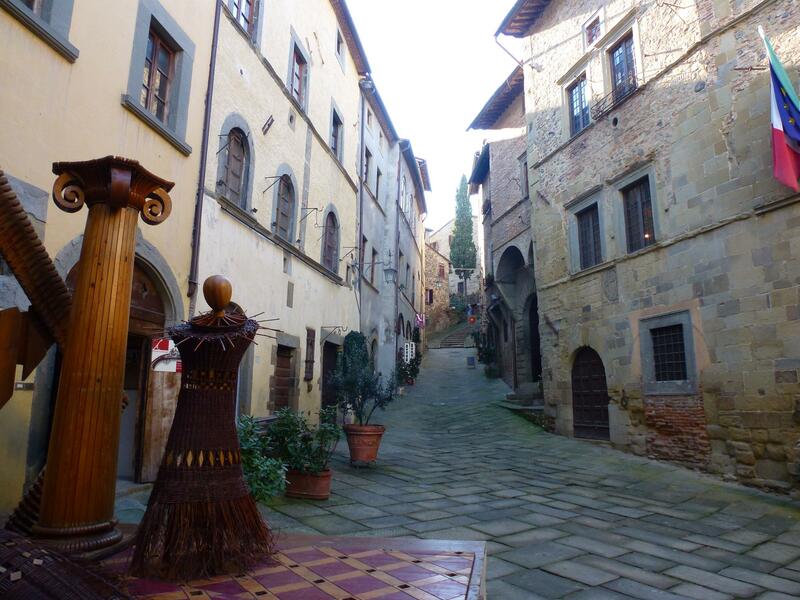 On one side of the road sits the ‘new’ 18th century buildings including the palace, On the other side is the walled medieval village which snakes up the hill on cobbles and narrow alleys, for us this was the archetypal Tuscan village we wanted to see. 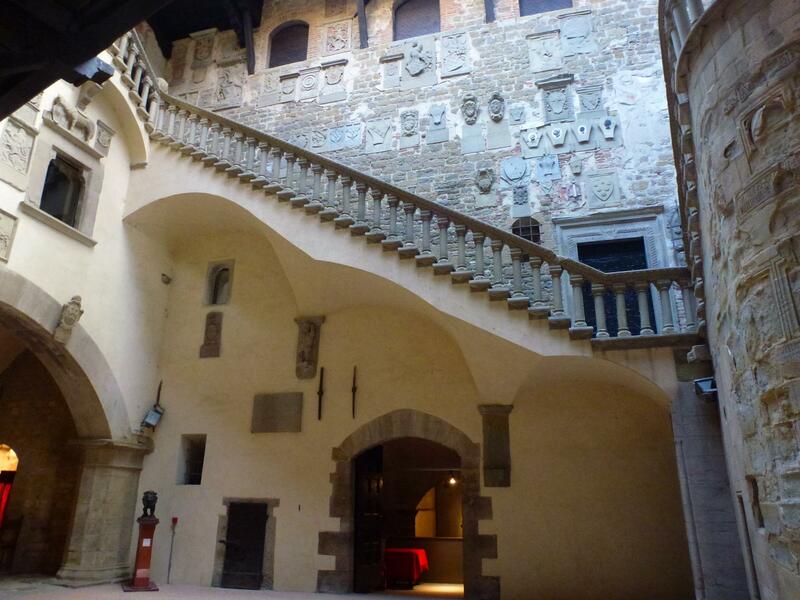 It was hard to tell what was open to tourists and what were private homes. We opened one door and found a beautiful church in what looked like the basement of a house, other open doors led into shops and cafes but some were straight into peoples living rooms, you could easily have ended up sitting with someone having their lunch at home. 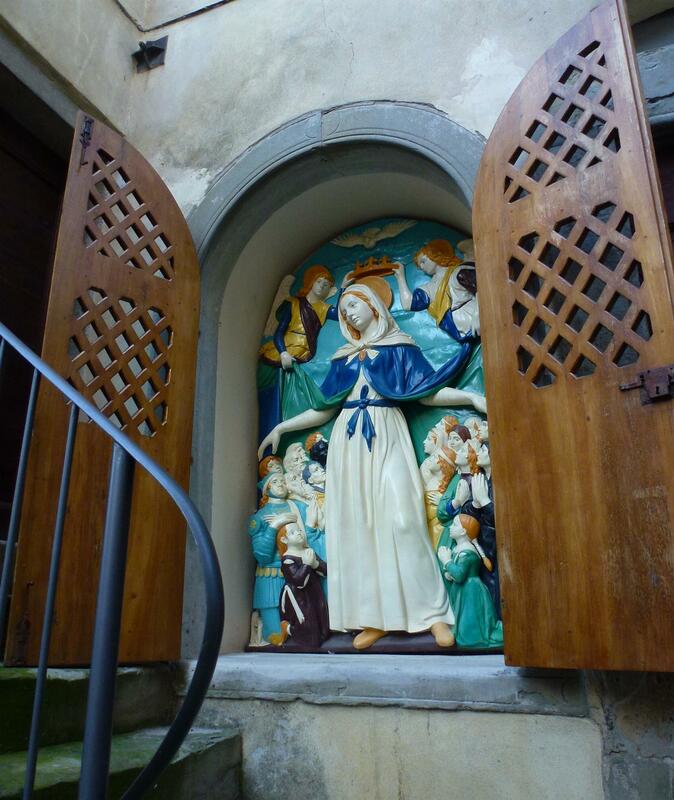 We tried the door of a tiny family cafe where they didn’t seem to be open but we knocked on the glass door and they welcomed us in for coffee, or possibly rocket fuel – we have never had such a strong espresso our eyes were out in stalks. 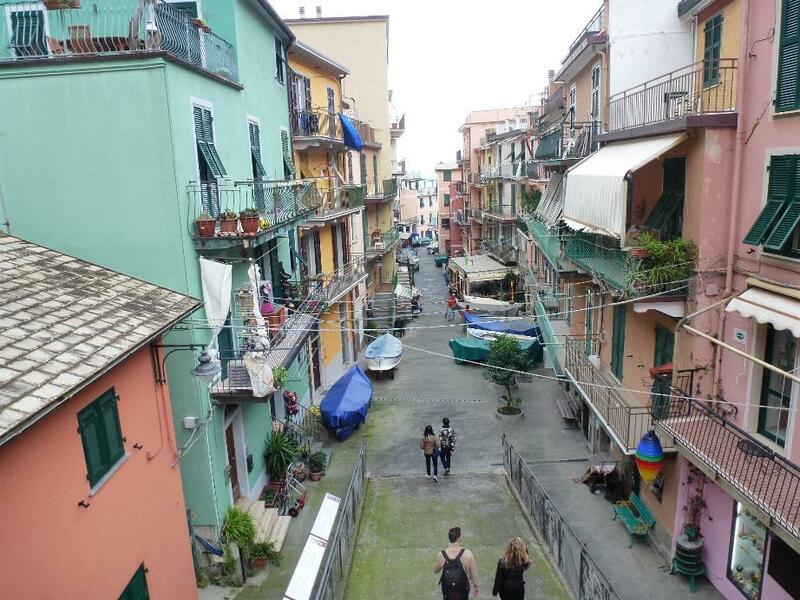 We both had some preconceived ideas that Italy would be a loud, brash and rushed place to visit. Maybe its been because we have kept out of the cities but it has been the opposite. People have been incredibly friendly, there seems to be little rush to do anything by anyone but to be fair it is a bit loud, if someone wants to talk they don’t seem to wait for a gap they just speak louder than the person already speaking 🙂 . Even though its Sunday all the shops in the village were open, Christmas songs blaring out and the locals all dressed in shinny coats, hats and scarves. It is actually roasting, we have spent the afternoon sat outside the van sunbathing, but I guess we are the ones they play ‘spot the tourist’ with in t shirts in mid December. Our weather forecast for the next week is sunshine all the way through to Boxing Day, we are seeing heavy fog in the mornings but the sun is warm enough to pop through by lunchtime. 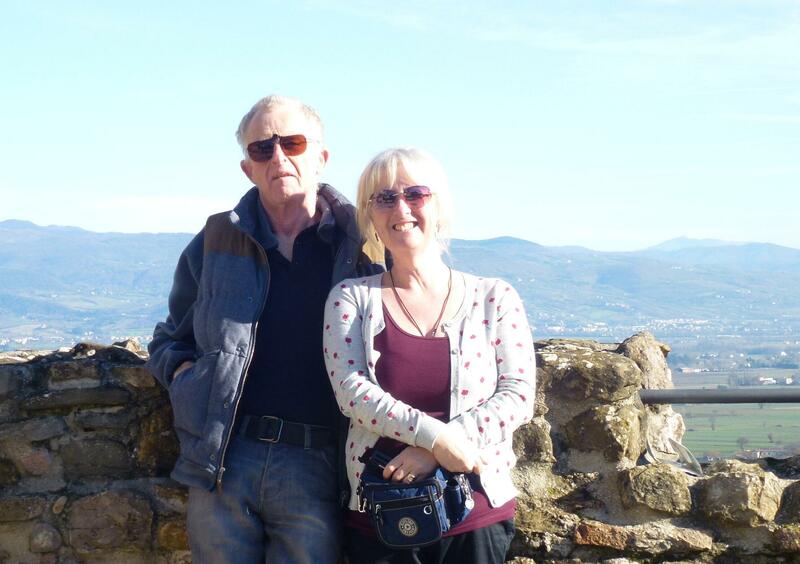 The plan is now to head into San Marino and spend a couple of days there over Christmas. We have contacted the one and only campsite in the country for a price and they have given us an eye wateringly high rate which will mean we only stay for a day or two, then we will start heading South looking for a ferry to Greece. Every week we seem to across something that fairly blows our minds, we wonder then what could possibly top it, last week the coast in Liguria was incredible so we thought maybe a week heading into Tuscany might be a bit less stunning. We were so very wrong. The week started with rain, we aren’t complaining it is December and we expect rain. To be fair we have seen so much good weather since we left home we must be due a fair bit of rain but its been sunshine and showers so nothing too dramatic yet. Each morning we always check the forecast and it has to be said we now check the forecast for Greece at the same time, any drizzle doesn’t seem to bad when we see the sun is out in the Peloponnese. One of the reasons for being away in winter is without a doubt to find some sunshine, we are now keeping a close check of the temperatures in Portugal versus Greece, hoping we made the right decision to head East for a change. From Deiva Marina the Cinque Terre were too close to pass up, the train station was less than five minutes from the campsite and it cost us €2.20 each to the villages. Using the train was a little more stressful than we anticipated, everything including the ticket machine is automated. It went reasonably well until the there were announcements of delays so we weren’t sure which train was actually ours, we took a guess and got it right. Monterosso, is a postcard pretty village but compared to the other four it didn’t compete with the overall view from the sea. 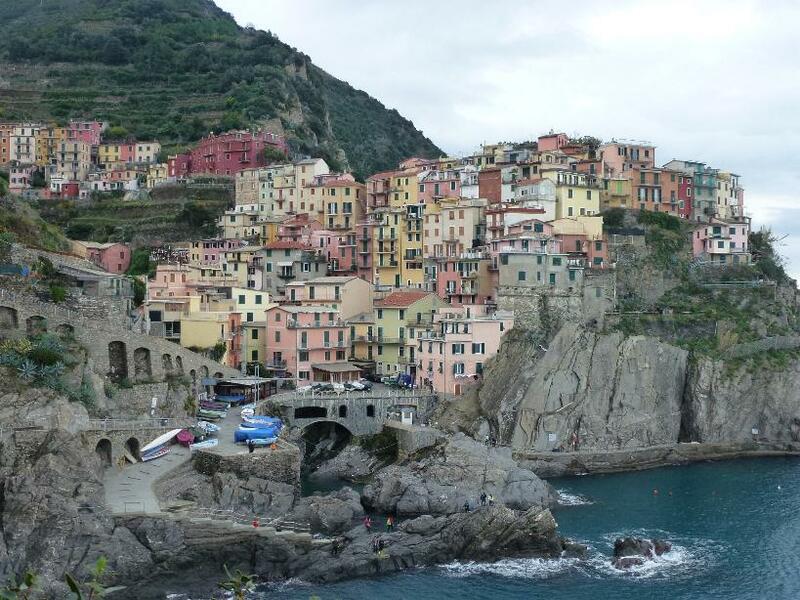 Whereas the other villages sit on rocks at the sea edge Monterosso has a sandy beach but once you are in the village it is without doubt stunning. But to be honest we really wanted that amazing sight from the sea and none of the ferry trips were running. There are coastal paths between the villages that give some awesome views but all bar one had been closed due to landslides in the last couple of weeks. 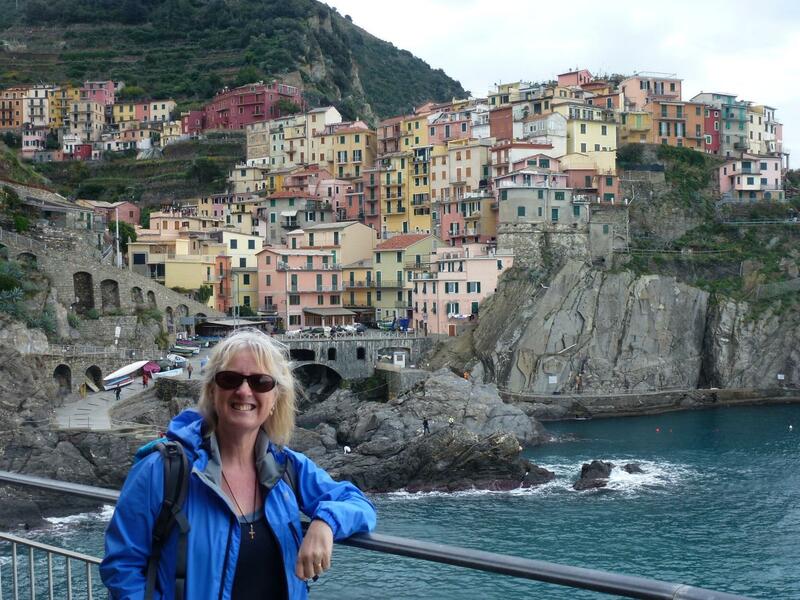 We thought out best chance would be Manarola as it seemed you get right down to the sea and look back so we hopped back on the train and sped through another few kilometres of tunnel. 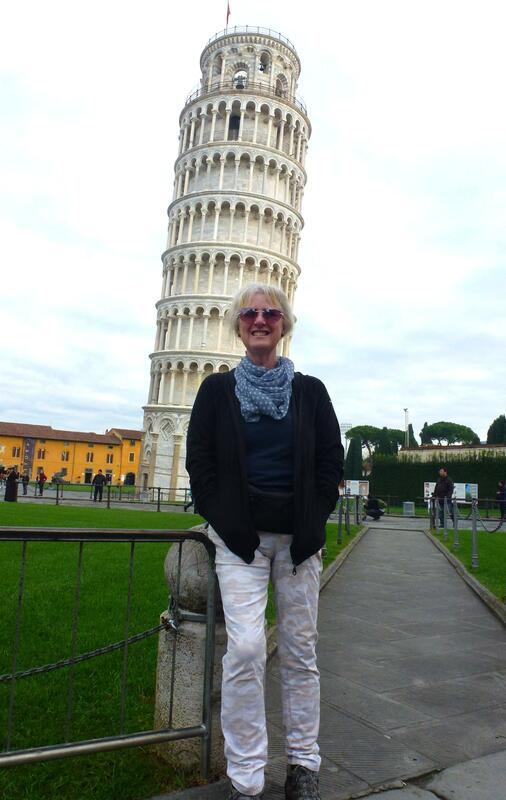 Having lingered on the Genoa coast for over a week we thought we would move on and with Pisa just a couple of hours down the road there was no way we could not stop off and have a lean with the tower. An easy drive right into the city for the sosta, until the Sat Nav took us wrong in the last 200 metres and we were opposite the entrance but needing to go around the oneway system to get in. A lovely lady on a scooter appears, points to sosta and when we nod she motions us to follow her as she takes us on a shortcut across a cycle path, through a garage and then up to the barrier – without a word she is off back in the traffic, people are so kind where-ever you are in the world. Prior to arriving in the city we had discussed the merits on staying in the city centre. To be honest we had concerns, mainly if it was only us there how safe would it be etc. We need not have worried, at least 50 vans parked up and right on the side of the main road which we think is always a good thing. We set off for a quick glance of the tower before tea, map in hand we were confident to be there in 15 minutes. Two hours later we had traversed the whole city and not a glimpse of any tower. Instead we had walked pretty much most of the city centre. The river Arno runs through the centre cutting the city in two and the whole thing is surrounded by incredible city walls, apparently these are the ‘new’ ones built in the 12th century. On both sides we found pedestrian areas a plenty and Christmas markets galore where we did treat ourselves to a very scrummy walnut brittle. All the big Italian named shops and just as many tiny boutiques and gift shops. What clinched it for us though is the buildings, every shop is topped by four or five storeys of magnificent Italian architecture. 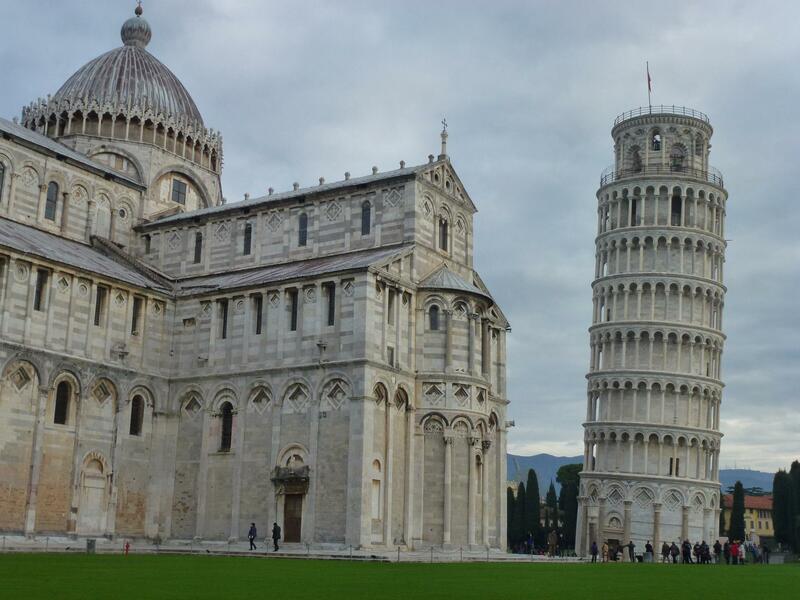 Pisa is more than worth the visit for the city itself, the tower is just icing on the cake. Day two, map in hand we set off for the tower, again. This time we found it fairly easily and have to say, it really does lean and to be quite frank looks like its going over someday soon. I had thought it started leaning a few hundred years after it was built, but no it was leaning as they built it so they just carried on and built the lean into the structure. Whilst we knew about the tower, we didn’t know that there is also the Cathedral, the Baptistry and the Monumental Cemetery, not sure if its just in your eye to look for leaning but the other buildings do not look that straight either. 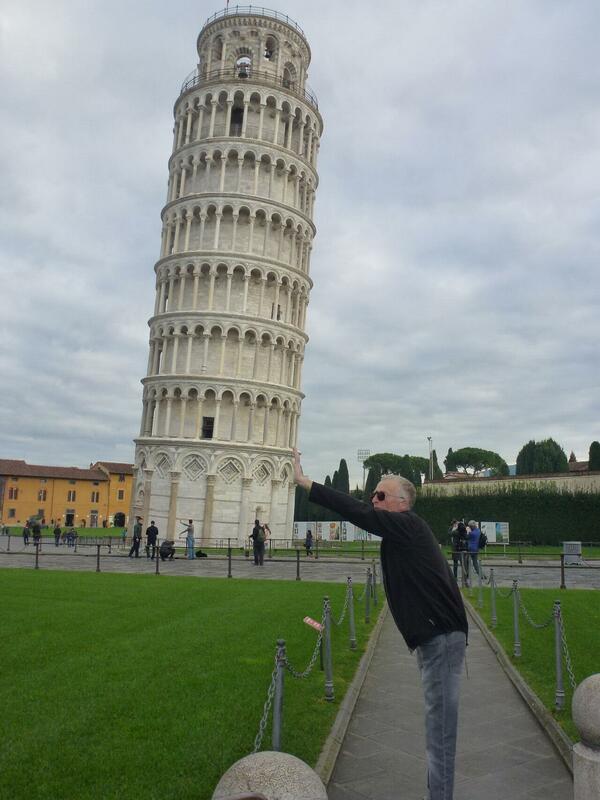 Of course we did the photo posing holding up the tower, it seemed that pretty much everyone there was doing the same, when in Rome…..
….. we are not going to Rome. Its been an on / off idea as to whether we want to go there or not and we have finally agreed we don’t. No reason other than its going to be hellish busy, so instead we are heading inland to Tuscany and over to the Adriatic coast for Christmas. We came a few miles inland last night to Montopoli to stay at a campsite we had found. We pulled in and it looked ok, no one else there and €27 a night. On our way through we saw a sosta in the village, free with 15 motorhomes on it. We went for the sosta, perfect for an overnight although we did realise during the evening all the other vans were empty – possibly just the villagers using it for parking during the winter. We were both pleased this morning to wake up and find we weren’t in the middle of a gypsy encampment as that thought was crossing our minds! We had a brief stroll around Montopoli, well more a stroll up as the village clings to side of a hill. At the top there was a viewpoint to see the glorious views of Tuscany set out around you – that didn’t happen due to severe fog. 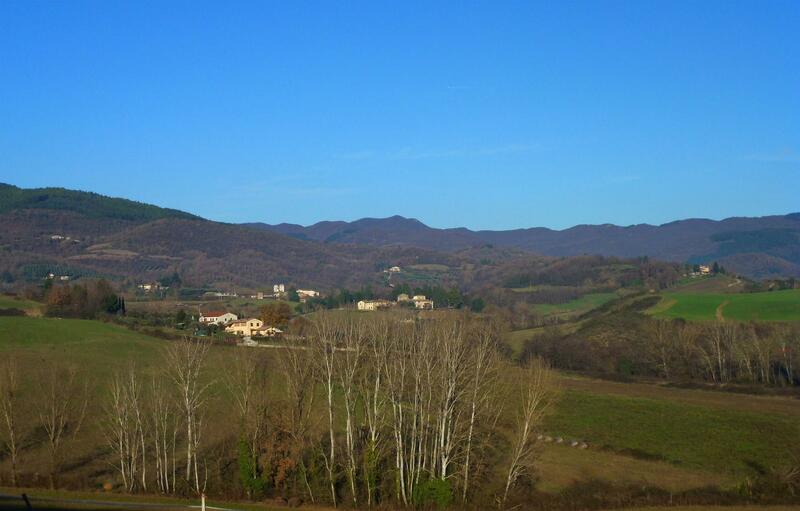 Today we move inland searching out medieval Tuscany.